Hello guys! 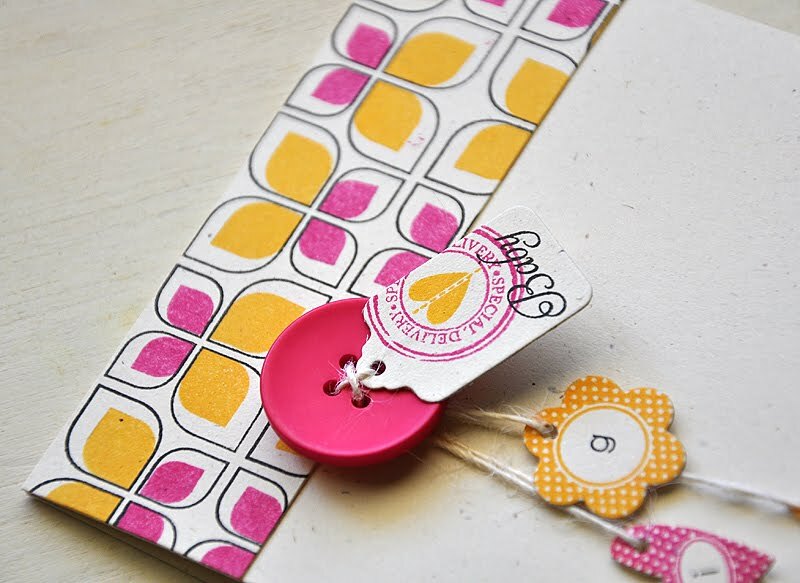 Well, it's about time I finally shared the last of my March Papertrey Ink release projects with you all. So let me get started... First up, Ribbon Tails. I stamped a polka dot Ribbon Tails strip, in Raspberry Fizz, across a white card front. Stamped and die cut a label, using Basic Labels stamp set and a coordinating die. 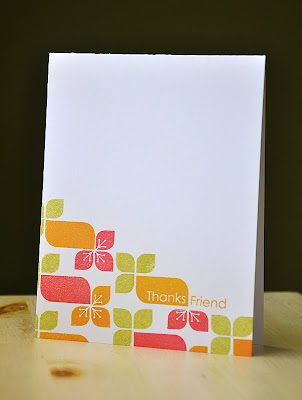 Then stamped the label with a sentiment from Star Prints and attached it over the stamped strip. Embellished the label corner with a Modern Basics flower and a True Black button. To give the card the effect of the polka dot Ribbon Tails strip wrapping around the card, I stamped and attached another strip with dimensional adhesive. Then finished the card off with another button. Here's A Tip: For a little added detail, I rounded the end of the top strip by inserting the end into a small circle punch (like in the photo above). Next up, Sending You and its coordinating die. 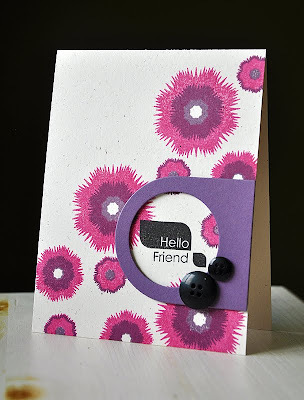 I went for a modern approach and chose to stamp these unique flower/flower centers in Raspberry Fizz and Plum Pudding onto a Rustic Cream card base. 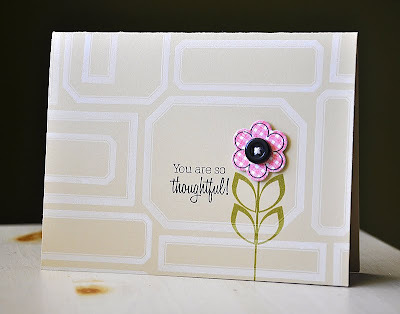 Stamped a sentiment focal point, using Modern Basics, and framed it using the Sending You Die Collection frame. To create, I started by die cutting the frame from Plum Pudding cardstock and then I die cut a circle from the center using the Limitless Layers: 1 3/4" Circle Die. How about some Tag-its #2 goodness?! This polka dot circle frame is just too cute! I stamped it onto Rustic Cream cardstock and cut it out by hand, stamped the adorable bird and attached to another Sending You die cut frame. Then attached the frame over a couple Spring Moss Ribbon Tails strips. 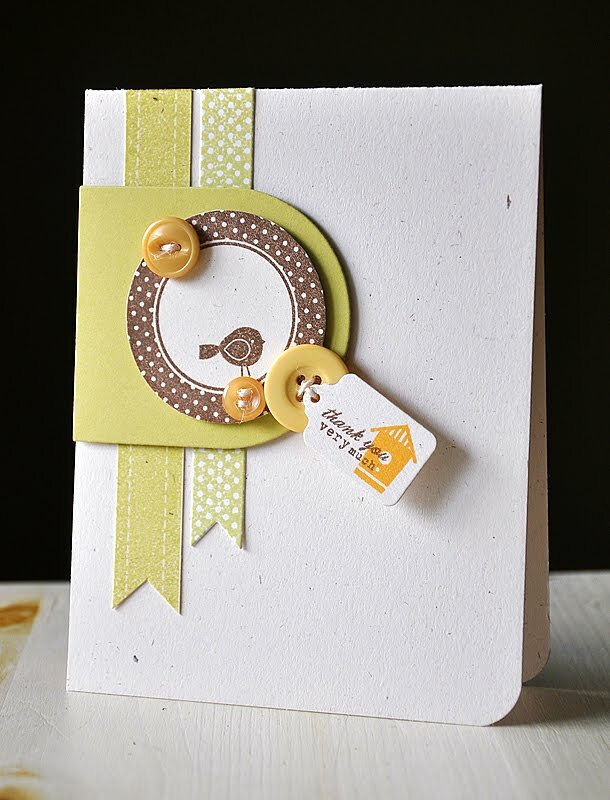 Finished the card off with a few Harvest Gold buttons and a die cut Tiny Tags, stamped with a bird house and sentiment (also from Tag-its #2). And finally, Flower Fusion #2. 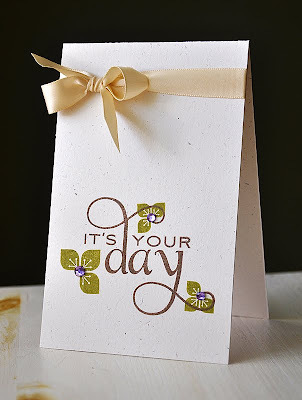 I started this card by stamping a number of frames, from Label Basics, in Fresh Snow onto a Fine Linen card base. 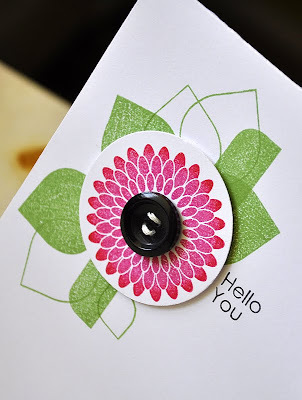 Stamped the flower stem twice in Ripe Avocado and topped it with a Flower Fusion #2 die cut. The die cut flower was stamped with Background Basics: Gingham (in Berry Sorbet), the outline Flower Fusion #2 flower (in True Black) and then topped with a button. 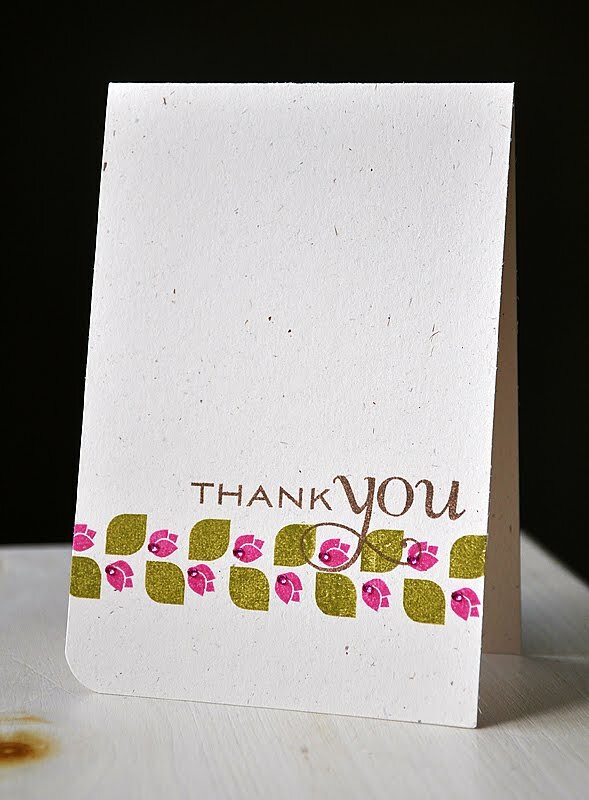 Finished the card of with a sentiment, also from Flower Fusion #2. Hope you've enjoyed the goodies from another fabulous release! 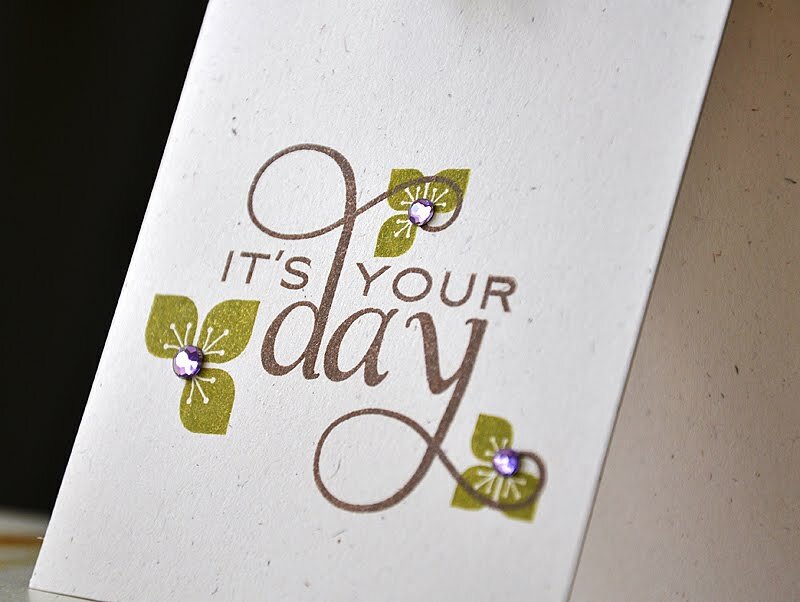 Have a great one! Hello, friends! 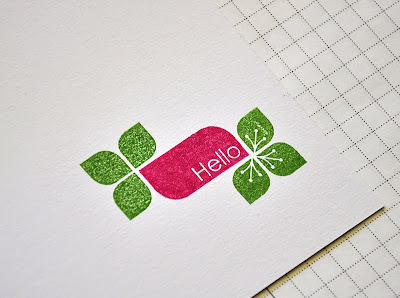 Just dropping in to let you know that I'm being featured over at the Moxie Fab blog today! 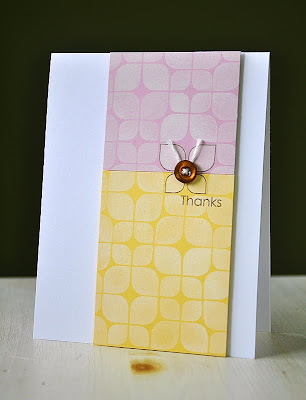 The card above was inspired by the fabulous Julia Stainton and her gorgeous card, found amongst the pages of Color Inspiration For Card Makers. Stop by here for all the details. Hi there! Today is the final day of the Papertrey Ink Countdown. Which means... Modern Basics will be available for purchase tomorrow! 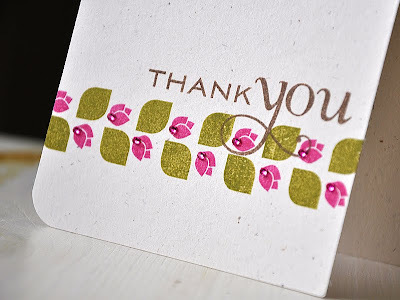 I thank you all for joining me each day of the countdown and for all the kind words you left me. If you do happen to pick up Modern Basics, I hope you will, so kindly, share your projects with me. I would love to see! This one here, is a vintage inspired project. I really wanted to combine some of the vintage images from Postmarks with Modern Basics. I think of these sets as complete opposites (style wise), and I thought it would be a great challenge to combine the two into one card. 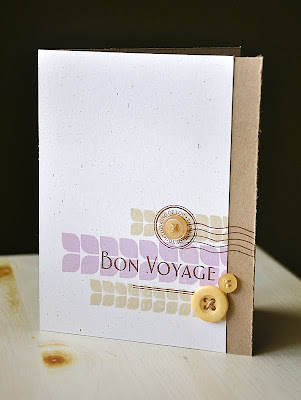 Stamped a Rustic White cardstock block with the large and small border images. 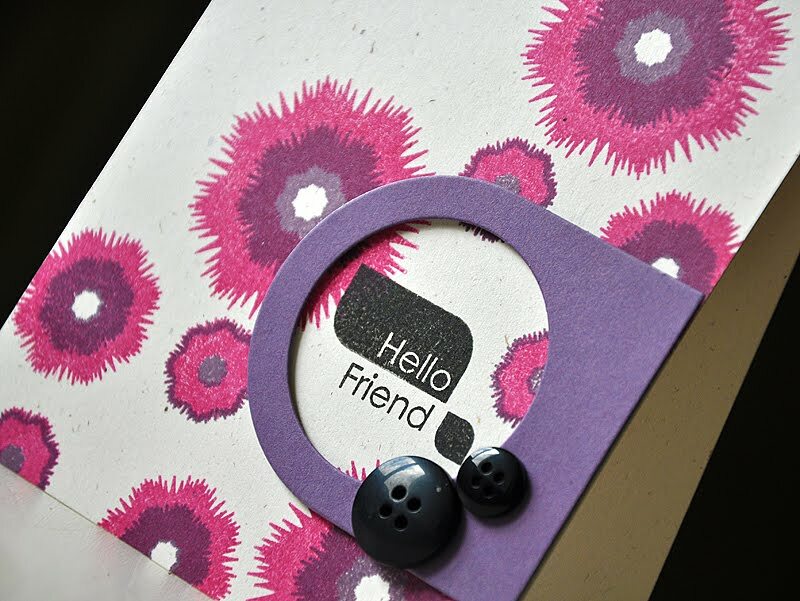 The large border was stamped in Lavender Moon and the small borders were stamped in Chia Vintage Touch. I then layered a "Thinking of You" postage circle, postage cancellation lines, "Bon Voyage" (these three from Postmarks) and double solid lines (from Label Basics) in Dark Chocolate. 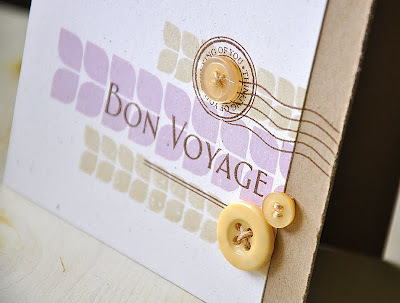 Then attached the Rustic White stamped panel onto a kraft card base and embellished with Harvest Gold buttons and twine. For the final vintage touch, I distressed the edge of the kraft card base. And finally, more of a masculine look. 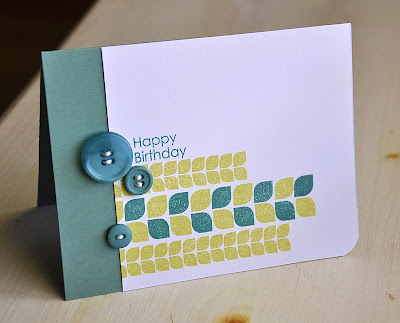 I stamped a white cardstock block with the borders in Spring Moss and Ocean Tides. Above that, I stamped the sentiment in Ocean Tides. 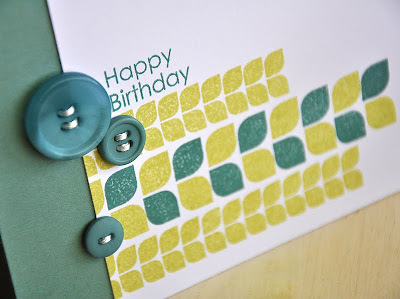 Attached the stamped cardstock block onto an Ocean Tides card base, embellished with a few Ocean Tides buttons and rounded the bottom corner. Well, that's all I've got for you today. 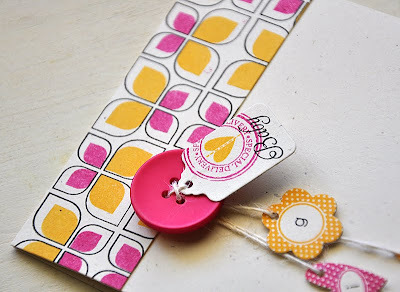 I hope you have enjoyed everything I've shared over the this months Papertrey Ink Release Countdown. 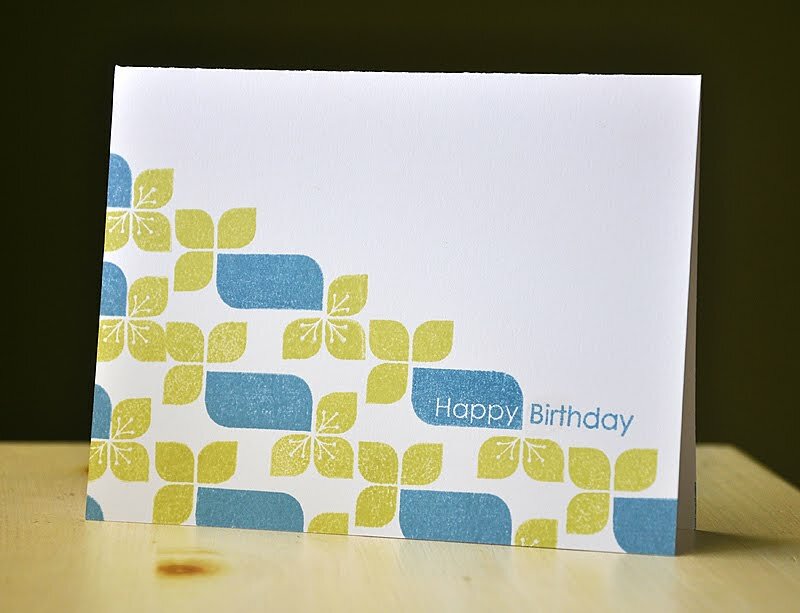 Don't forget tomorrow is the big day and Modern Basics will be available for purchase at Papertrey Ink. Thanks for dropping by today, have a super one! Hello, and welcome to the second Group Post of the Papertrey Ink Countdown! 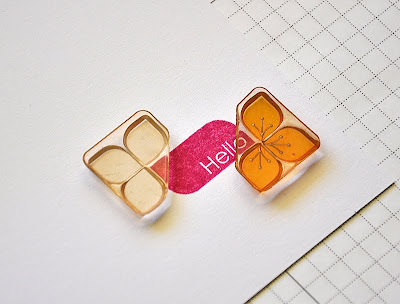 Today the design team brings you creations using the Tiny Tags stamp set and die (available March 15th), that showcase different ways to attach these treasures to projects of your own. Tiny Tags includes a super fun assortment of tiny tag images, tag shapes, tiny mats and tiny sentiment. Here's a sample of just a few... These polka dot tags inspired me to create an adorable baby girl card. 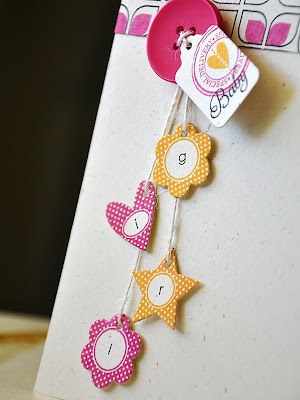 I thought it would be fun and fitting to create a baby mobile theme using these tiny tag treasures. 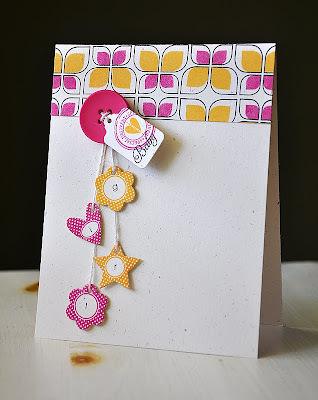 I started by die cutting from Rustic Cream carstock and stamping the flower, star and heart tags in Raspberry Fizz & Summer Sunrise. Into the middle of each tag I stamped the letters to spell out "GIRL" using Simple Alphabet. Attached a strand of twine behind each tag and attached the loose ends together at the top of the card base. Then attached the tiny tags to the card base with dimensional adhesive. 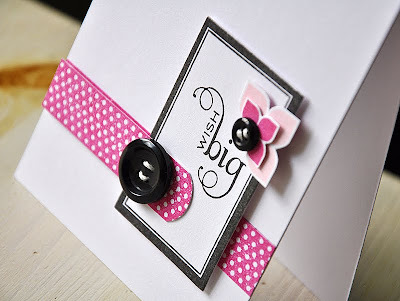 To the top of the card base, I attached a coordinating hand stamped strip of cardstock (created using Modern Basics) and then hid the twine ends with a large Raspberry Fizz button & tag. The tag was die cut using the Tiny Tags Die. 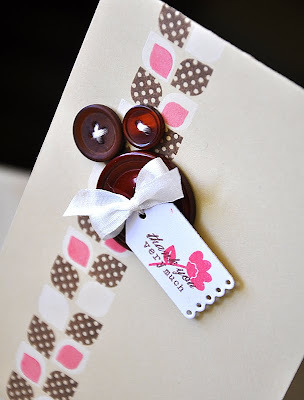 Then stamped with a "Special Deliver" (from Postmarked) in Raspberry Fizz, a stitched heart in Summer Sunrise and "Baby" in True Black (both from Tiny Tags), and then tied to the button before it was attached. 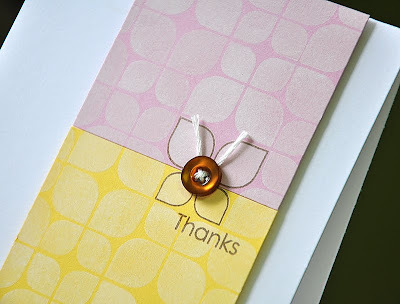 Here's How: (Before I start, I want to note that the pattern on this card was created in the same fashion) Start with a butterfly stamped at the top and center of the cardstock. 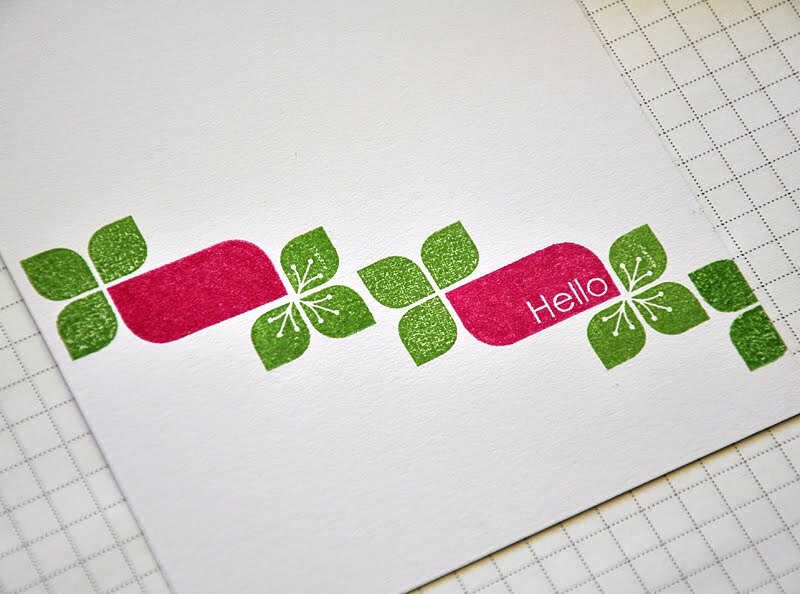 Flip over and stamp again on either side. Turn image again and stamp to finish the first row. Start the next row in the center, with the butterfly in the opposide direction as the one above. Continue to stamp the next row in the same fashion. Now to incorporate the coordinating colors... 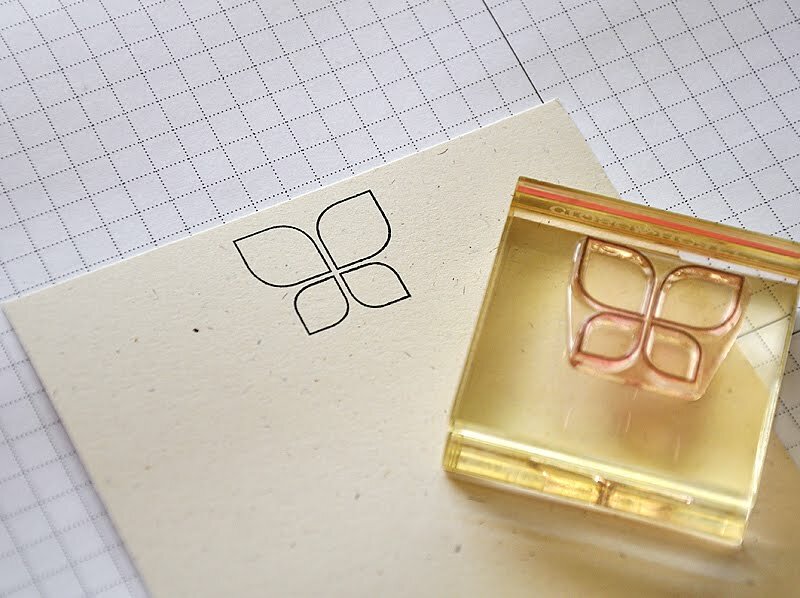 Stamp the smallest solid square into all of the smaller squares of the butterfly images. I completed this step using Raspberry Fizz ink. To finish it off, stamp a larger solid square with in the largest squares of all the butterfly images. 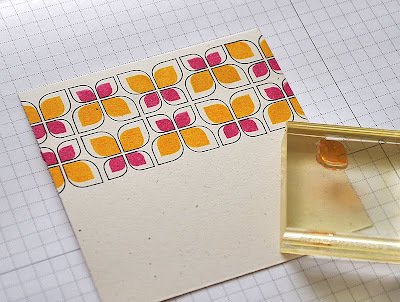 I used Summer Sunrise ink for this step. 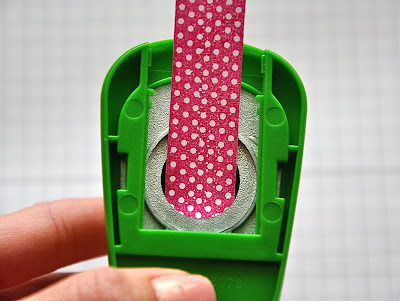 Then trim to fit your project. Thanks for stopping by, have a great one! It's day four of the Papertrey Ink Countdown and today I bring you a few more samples of Modern Basics (available March 15th). This time around I'd like to focus on one of the borders included in the set. 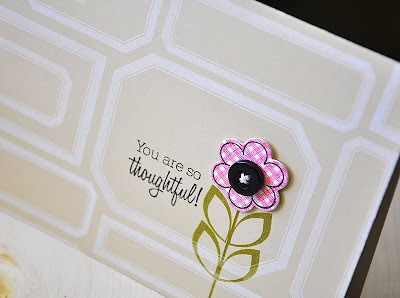 Nichole did an amazing job featuring Modern Basics yesterday and she showcased this same border images perfectly. Be sure to visit here to check it out, in case you missed it. 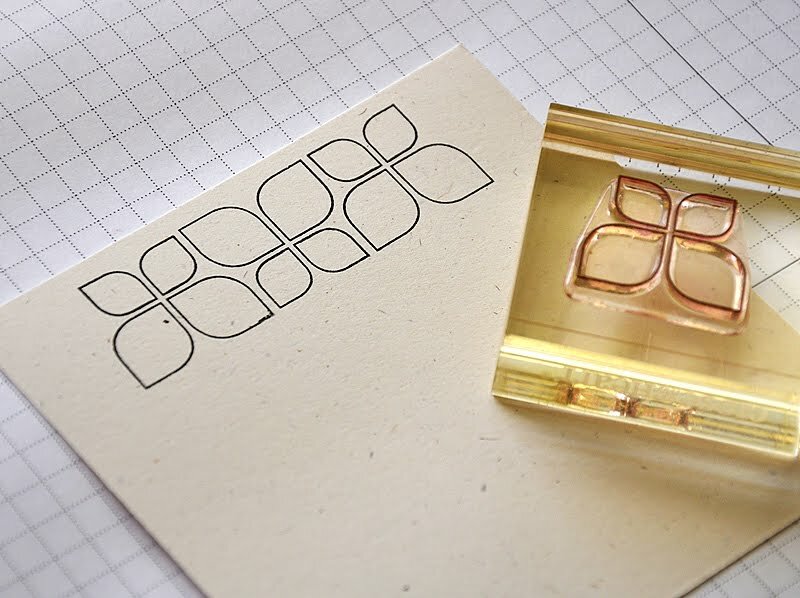 This is a sample of how this border stamp works and can be used. The image on the left is the actual stamp it's self. I've purposely designed this image with open spaces, so other colors or designs can be tucked inside to create a unique look that can suite any project. The second images is the boarder image stamped twice. This is an easy way to incorporate a second color. 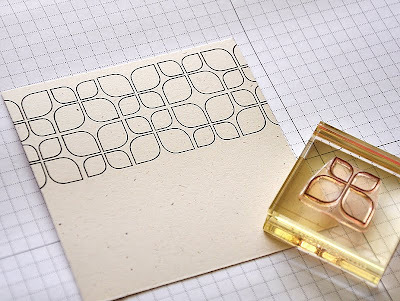 Just stamp once, ink again in desired color and stamp again slightly higher than the first impression. Again, Nichole Heady did an amazing job of featuring this technique. The third image incorporates a few other options for the open spaces, using images from Modern Basics and from other sets. The flower bud is from With Sympathy and the other three are from Postmarked. 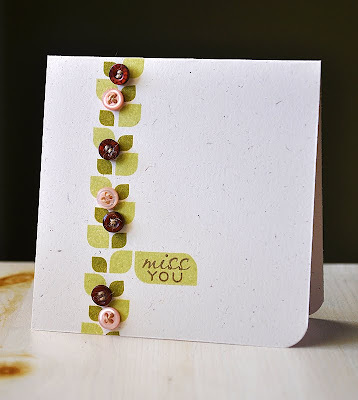 This Miss You card started with the border image stamped in Spring Moss onto Rustic Cream cardstock. 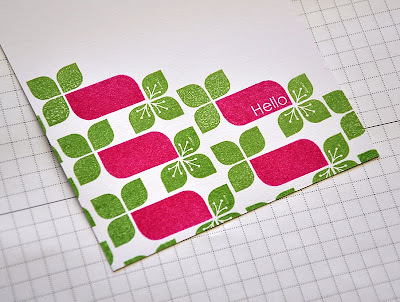 Within the open spaces I stamped each tiny square (also from Modern Basics) in Ripe Avocado. 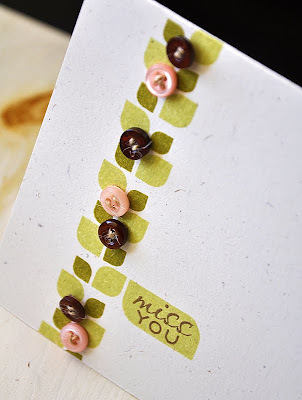 I then stamped the rectangle in Spring Moss and layered a sentiment (from Communique Curves Sentiments) in Dark Chocolate. Embellished with a few Sweet Blush and Dark Chocolate buttons and rounded the bottom corner. For this simple card I used a bud images from With Sympathy. Stamped the border in Ripe Avocado and the buds in Raspberry Fizz onto Rustic Cream cardstock. 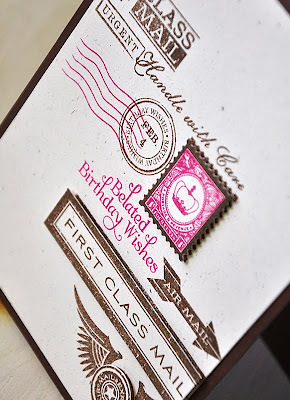 Above the border I stamped a sentiment from the new Think Big Favorites #2 in Dark Chocolate. Finished the card off with tiny rhinestones and a rounded corner. Finally, this card incorporates a couple other images (from Modern Basics) within the border. Started by stamping the border images in Fresh Snow onto a Fine Linen card base. Into the open spaces, I stamped the polka dot squares in Dark Chocolate. Then, once the Fresh Snow ink was dry, I went over the border image and stamped small squares in Raspberry Fizz. Topped the card off with three Dark Chocolate buttons, a white silk ribbon bow tied through the large button and an adorable tag stamped with a flower and a sentiment from Tag-it's #2. Finished by rounding the bottom corner. I hope you've enjoyed everything I've shared with you today! Again, I'd love to know what you think, so please let me know. Hello and welcome to day four of the Papertrey Ink Countdown. Today is also the Design Teams Group Post day. 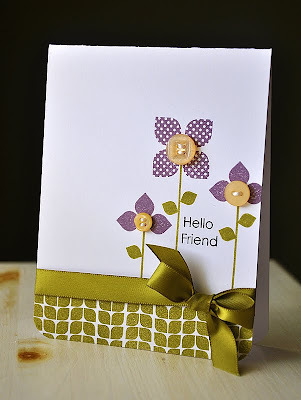 For today, Nichole has asked the Design Team to share projects using the new Postmarks stamp set and the coordinating dies. Which are all available on March 15th. 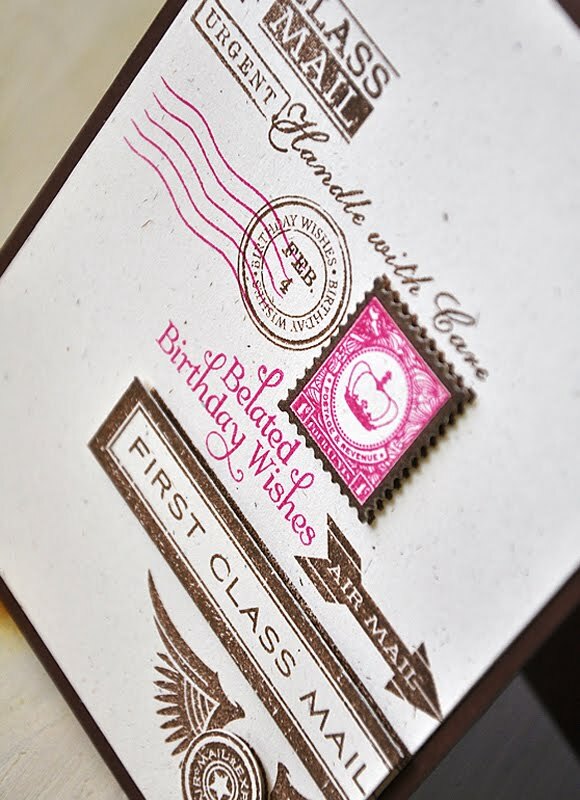 Postmarks comes packed with a great assortment of vintage inspired mail and postage images. I thought it would be fun to combine a number of these images to create something I don't create too often, a belated birthday card... I started by pulling out any stamp images that applied to this theme. Played around with different and possible arrangements by placing the actual stamps face down onto the Rustic Cream cardstock block. Once I came up with an arrangement that fit across the card and one I was happy with, I started stamping. I started at the bottom right corner and worked my way up and across. To draw attention to the sentiment and create a focal point, I picked two images and stamped all three (two images plus the sentiment) in Raspberry Fizz. All other images were stamped in Dark Chocolate. 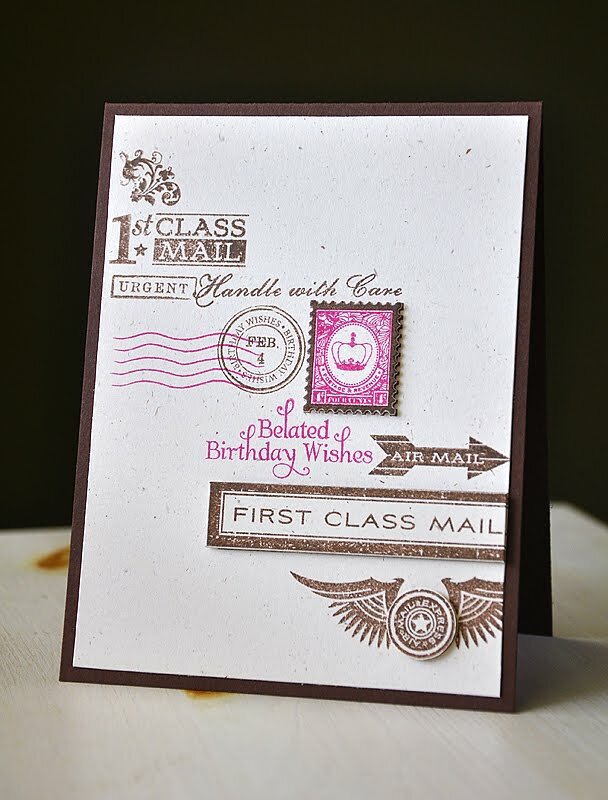 For a bit of dimension I attached the postage stamp (die cut using the Postage Die), "First Class Mail" (die cut using one of the Rectangular Labels Dies) and "Express Mail" circle (Cut by hand) all with dimensional adhesive. 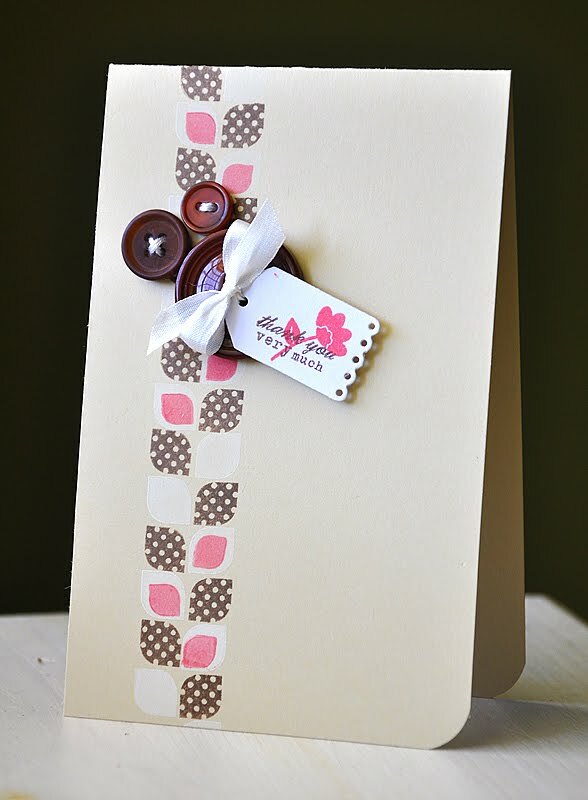 Then attached the stamped cardstock panel to a Dark Chocolate card base. 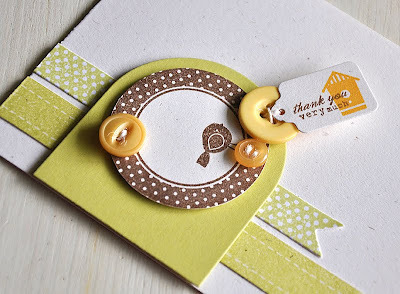 I love how this vintage set is clean enough to be easily incorporate into any clean and simple card or project. It's sure to fit any style! 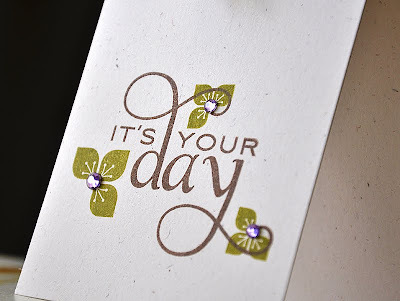 It's the third day of the Papertrey Ink Countdown and I hope you are enjoying everything so far. 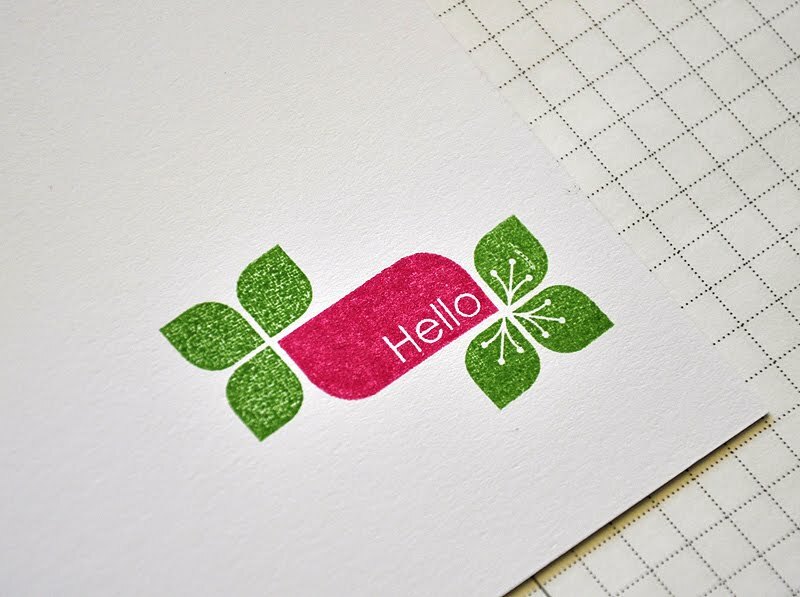 Today I bring you yet another introduction to Modern Basics (which is available for purchase on March 15th through Papertrey Ink). My focus this time around was to think outside of the box and show a little more versatility using Modern Basics. First up, a sample turning a few images into a modern flower and leaves card... I combined the solid & linear squares with the solid rectangle. 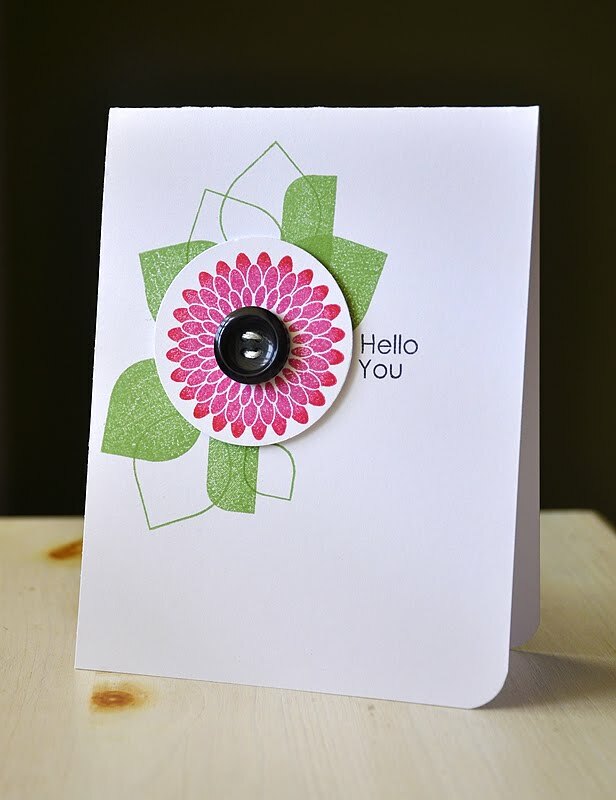 Then paired Modern Basics with a modern flower from All About You. Stamped the squares and rectangles randomly onto a white card base (in New Leaf), like so. Then I stamped the sentiment, also from Modern Basics, in True Black. The flower was inked using the Rock & Roll technique, inked first in Raspberry Fizz and then rolled the edges in Pure Poppy. Stamped it onto a punched circle, attached to the card base with dimensional adhesive and them embellished with a button and twine. Next, I turned the leaf trios (that I shared with you yesterday) into flowers. 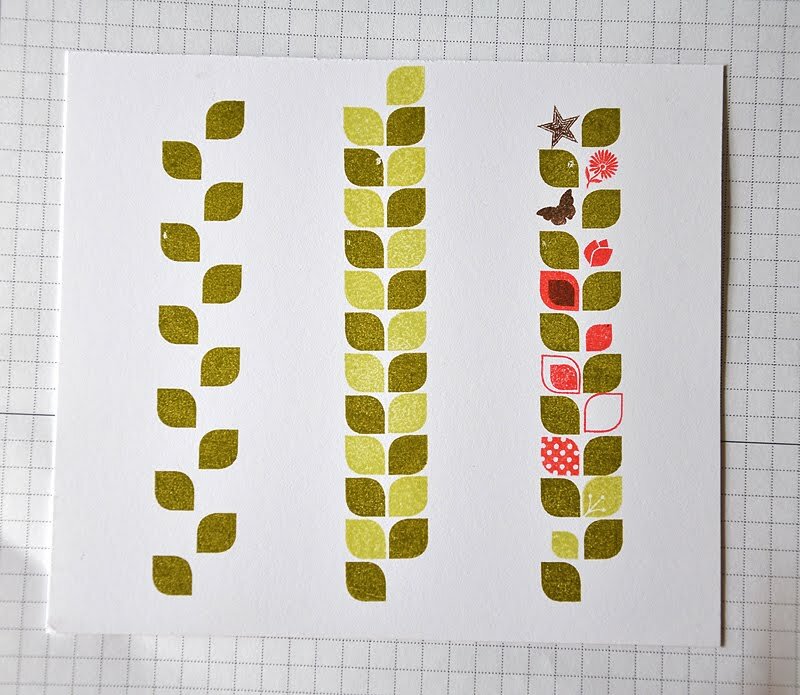 I started by stamping a few stems using the stem images from Green Thumb. Topped two stems with the solid leaf trio image, in Plum Pudding. I then stamped the polka dot square four times, also in Plum Pudding, to create the larger flower. 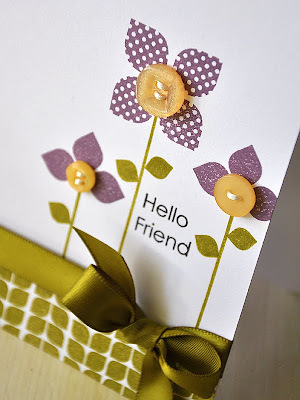 Embellished the flower centers with Harvest Gold buttons and white embroidery floss. 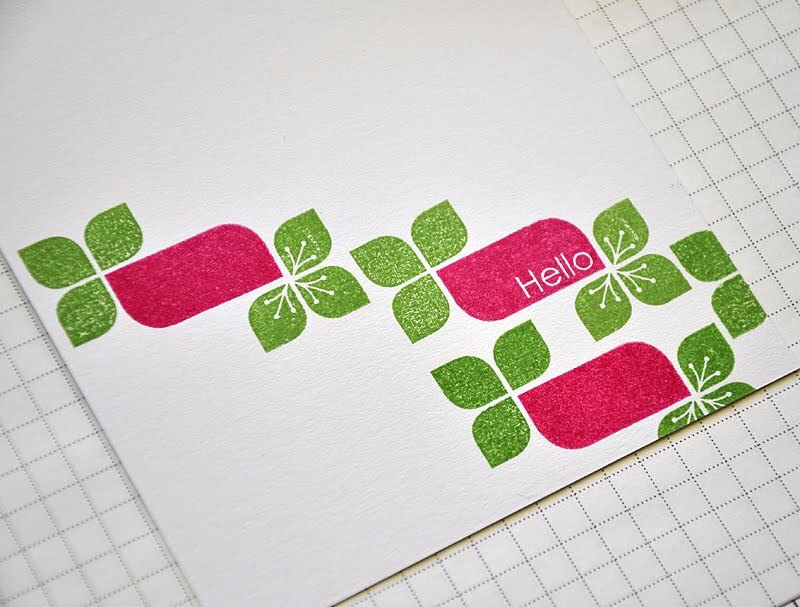 Stamped a few leaves using the smallest square and a sentiment, both included in Modern Basics. At the base of the card I used a border image from Modern Basics, one you haven't seen yet. I stamped, in Ripe Avocado, the border image repeatedly in opposite directions and then rounded the bottom corners. Finished the card of with some Ripe Avocado satin ribbon. Finally, for this simple creation I combined Modern Basics with a sentiment from another new set called Think Big Favorites #2. 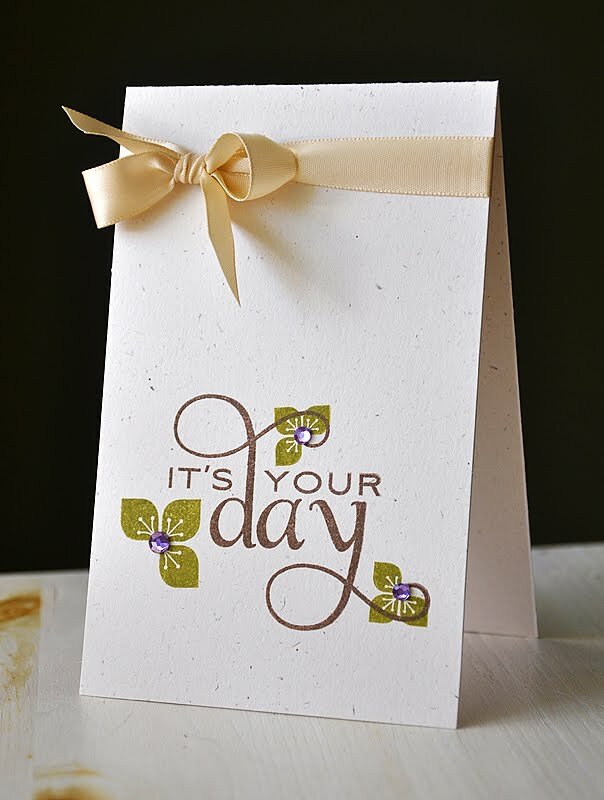 Stamped the sentiment in Dark Chocolate onto a Rustic Cream card base. 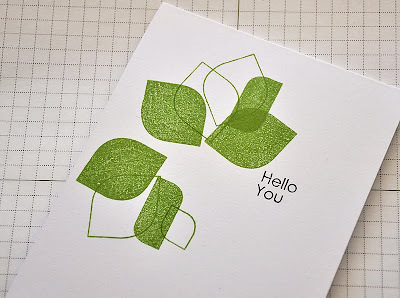 Stamped, in Ripe Avocado, the small leaf trios at the embellished end of the sentiment and the large leaf trio in the sentiment corner. 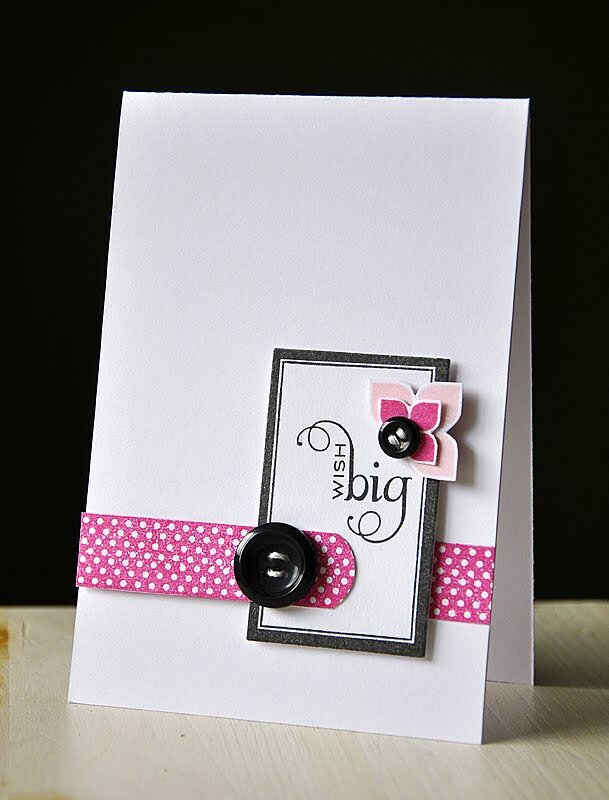 Embellished with rhinestones and finished the card off with Fine Linen satin ribbon. Well, I hope you've enjoyed this look at additional uses for the images included in Modern Basics. That's all that I have for you today. I hope you enjoyed! Again, I'd love to know what you think. Hello and welcome to the 2nd day of the Papertrey Ink countdown! Today, I like to share with you more of the pattern ability of my new stamp set, Modern Basics. 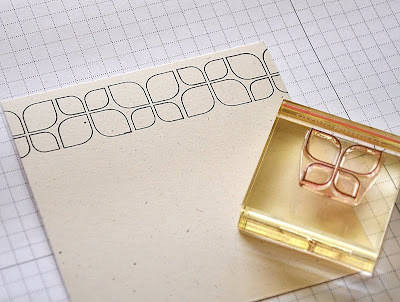 There has been some concern in the Papertrey Ink forum as to the difficulty of creating a hand stamped pattern with this set, and keeping things lined up and straight. So I hope today's samples and tutorial will put those concerns at ease and show you just how easy it truly is. 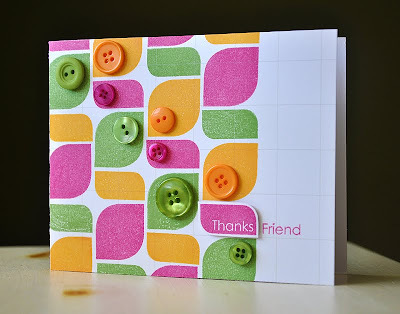 I'll also be featuring a few peeks at the unique and fun sentiment combinations available in this set. So, let me get started with a few samples using other new images included in Modern Basics... This bold background was stamped using two images, the rounded large square and rectangle, in Raspberry Fizz, Summer Sunrise & New Leaf. 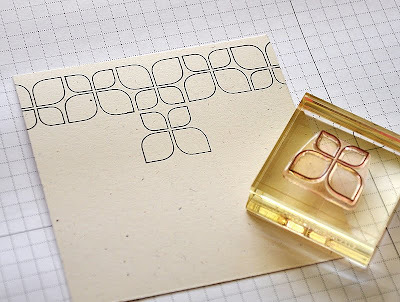 Here's a Tip: To aid in keeping images straight and as an added detail, I've stamped this pattern onto a Guidelines I Grid cardstock card base. This is not necessary but, it can be helpful. This background was stamped using the pattern featured on the sample strip. Alternating the square and rectangle, matching up the corners and interchanging colors. Here's A Tip: Focus on join the corners together. This gives you a visual to aid in keeping images nicely lined up. 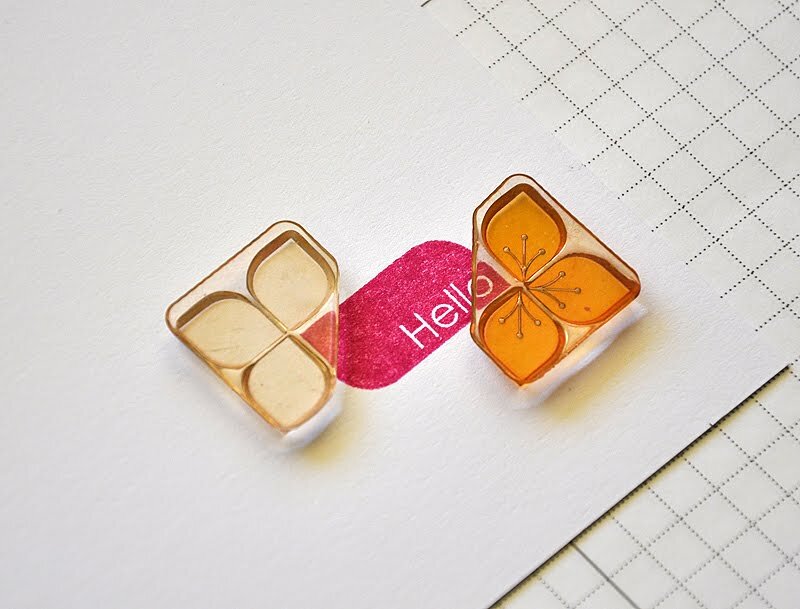 Also, the majority of shapes included in this set are simple and can easily be seen through, to further help you when lining up and choosing your stamp placements. 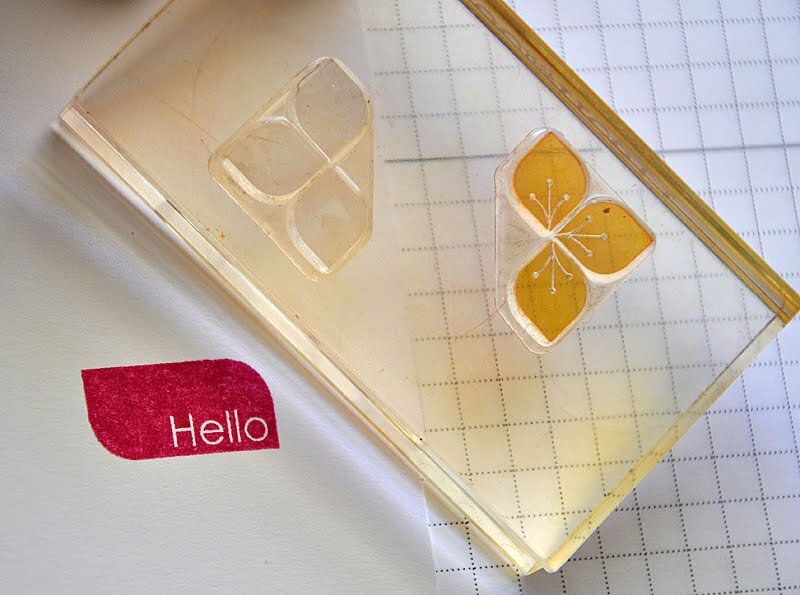 Here's a Tip: Another useful trick is to attach multiple images to your acrylic block (please excuse my messy stamps and block) and stamp them all at once. With the two shapes attached, as above, I was able to ink both (in different colors) and stamp in once press. Now for the fun part... 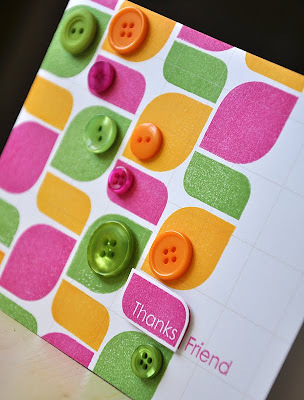 I finished the card off with coordinating colored buttons and stamped "Friends" onto the card base. Then stamped, hand cut and attached the "Thanks" rectangle to complete the sentiment. 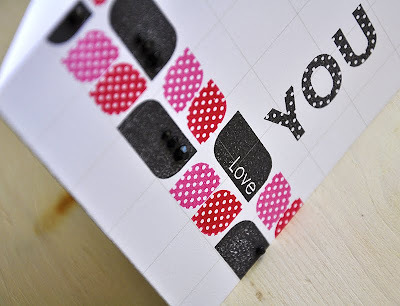 Next up, a fun border using the "love" rectangle, the solid rectangle and the polka dot square. 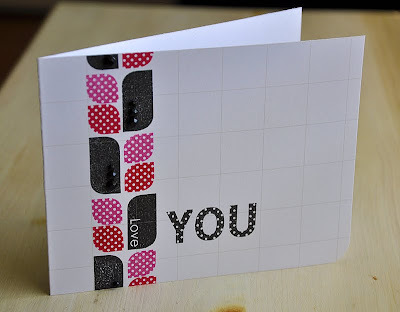 All stamped in a color combo of True Black, Pure Poppy and Raspberry Fizz to keep with the love theme. 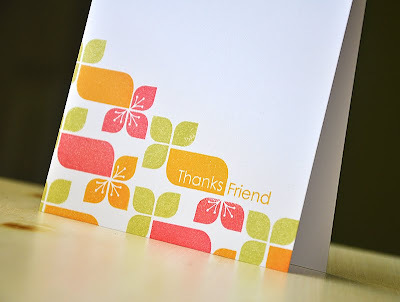 Again, I used the Guidelines I Grid cardstock, I like the added detail it adds to this simple card. 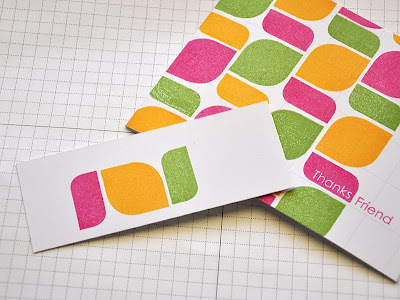 Here's How: I stamped the first row (following one of the lines of the paper) in the pattern of: rectangle-polka dot squares-polka dot square. From top to bottom. I then repeat the pattern to complete the second row. Finished the card off with "YOU", from All About You, in True Black and added a few black rhinestones. 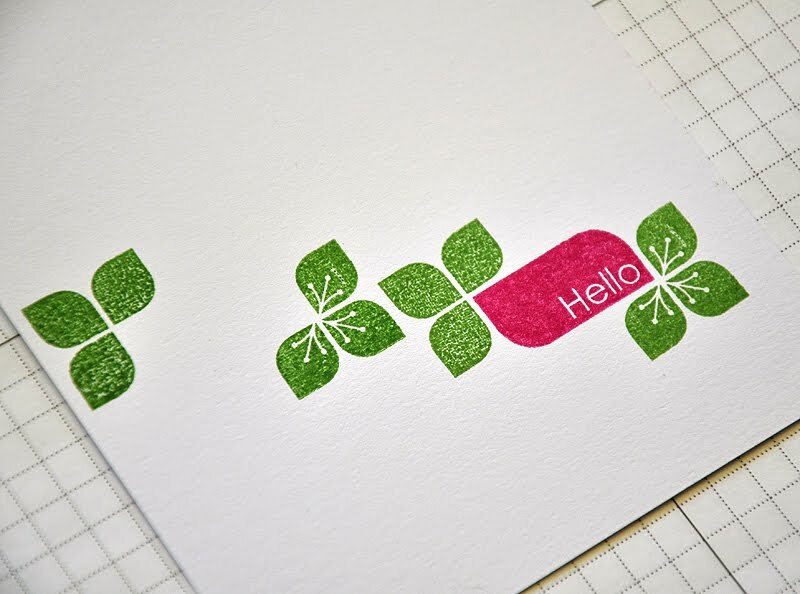 Here's the final pattern for today using the "Thanks" rectangle, solid rectangle and the two leaf trio images. I stamped this fun pattern into the bottom corner of a white card base and in a color combo of Spring Moss, Berry Sorbet and Summer Sunrise. No worries thought, this pattern is really much simpler than it looks! Here's How: I like to start by stamping the sentiment rectangle first, this ensures a proper placement and give me a good starting point. I then take the two leaf trio stamps and place them on either side of the rectangle corners (backsides up). Again, please excuse my messy stamps and block. 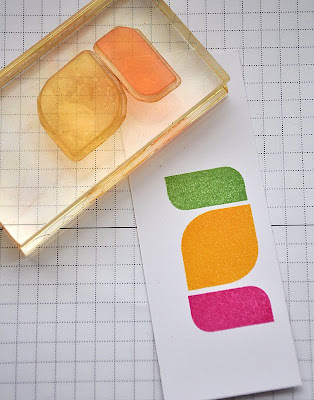 :) I then pick the stamps up with an acrylic block and they are ready to go. 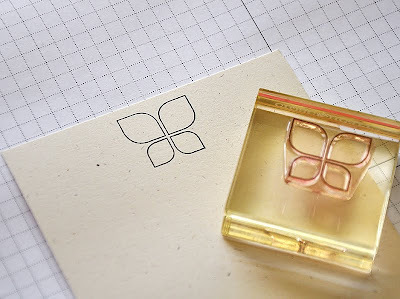 Here's a Tip: At this point, before you stamp, you have the option to ink both in one color or ink both in different colors. For this sample, I inked both leaf trios in New Leaf and then stamped into place. 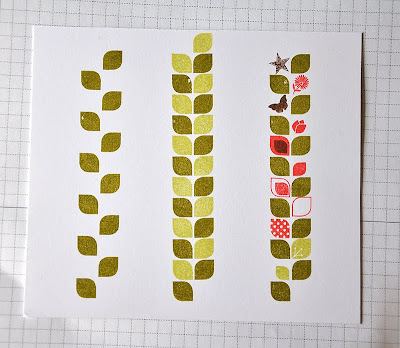 Inked both up again and stamped just above and next to the previously stamped leaf trios. 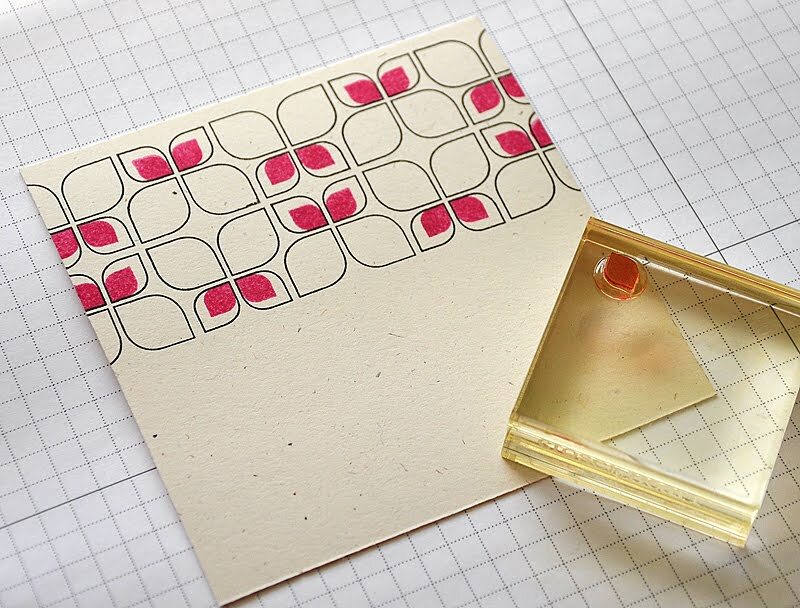 With in the leaves it was easy to stamp another Raspberry Fizz rectangle into place. Once done with the first row it was easy to re-stamp a second row, in the same fashion, directly below the first. I continued to stamp and finish that row. And continued this process until the corner was complete. See, not so bad. Right?! This same pattern works perfectly for cards in the other direction as well. Well, that's all that I have for you today. I hope you enjoyed! Again, I'd love to know what you think. Any question, just ask!